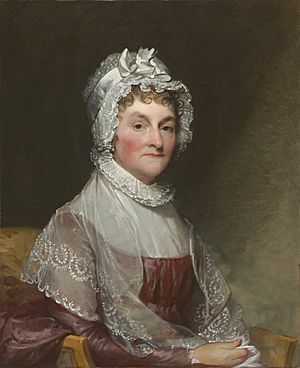 Abigail Smith Adams (November 11, 1744–October 28, 1818) was the wife of John Adams, the second President of the United States. Later on, people started to address the wife of the president as the First Lady. So, she became the second First Lady of the United States. She was born in Weymouth, Massachusetts. She belonged to a famous family of Massachusetts (the Quincy Family). Adams did not get any formal education in any school or college. Her father had a big library, so she studied a number of books and became knowledgeable. She married John Adams in 1764. In next ten years, she had five children (a sixth was stillborn), including John Quincy Adams, the sixth President of the United States. In 1801, the couple retired and lived in Quincy. Abigail died in 1818, at age 74 of typhoid fever. Abigail was born in the North Parish Congregational Church at Weymouth, Massachusetts on November 11, 1744 to Rev. William Smith and Elizabeth Quincy Smith. By the calendar used today, it would be November 22. On her mother's side, she was descended from the Quincy family, a well-known political family in the Massachusetts colony. Her father (1707-1783), a liberal Congregationalist, and other forebears were Congregational ministers, and leaders in a society that held its clergy in high esteem. However, he did not preach about predestination, original sin, or the full divinity of Christ, instead emphasizing the importance of reason and morality. Although she did not receive a formal education, her mother taught her and her sisters Mary (1746-1811) and Elizabeth (known as Betsy) to read, write, and cipher; her father's, uncle's and grandfather's large libraries enabled them to study English and French literature. As an intellectually open-minded woman for her day, Abigail's ideas on women's rights and government would eventually play a major role, albeit indirectly, in the founding of the U.S.
Abigail Smith married John Adams on the October 25, 1764, just before Abigail's 20th birthday. John and Abigail Adams lived on a farm in Braintree (later renamed Quincy) before moving to Boston where his law practice expanded. In ten years she gave birth to five children: Abigail (1765-1813), the future President John Quincy Adams (1767-1848), Susanna Boylston (1768-1770), Charles (1770-1800), and Thomas Boylston (1772-1832). A sixth child, Elizabeth, was stillborn in 1775. She looked after family and home when he went traveling as circuit judge. As wife of the first Vice President, Abigail became a good friend to Martha Washington and a valued help in official entertaining, drawing on her experience of courts and society abroad. After 1791, however, poor health forced her to spend as much time as possible in Quincy. Illness or trouble found her resolute; as she once declared, she would "not forget the blessings which sweeten life." When John Adams was elected President of the United States, she continued a formal pattern of entertaining, becoming the first hostess of the yet-uncompleted White House. The city was wilderness, the President's House far from completion. She took an active role in politics and policy, unprecedented by Martha Washington. She was so politically active that her political opponents came to refer to her as "Mrs. President". The Adamses retired to Quincy in 1801 after John Adams' defeat in his bid for a second term as President of the United States. 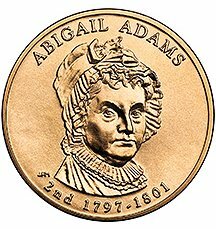 Abigail Adams died on October 28, 1818, of typhoid fever, several years before her son became president, and is buried beside her husband in a crypt located in the United First Parish Church (also known as the Church of the Presidents) in Quincy, Massachusetts. She was 73 years old; John Adams was 90 when he died. Her last words were "Do not grieve, my friend, my dearest friend. I am ready to go. And John, it will not be long." Adams was an advocate of married women's property rights and more opportunities for women, particularly in the field of education. Women, she believed, should not submit to laws not made in their interest, nor should they be content with the simple role of being companions to their husbands. They should educate themselves and thus be recognized for their intellectual capabilities, so they could guide and influence the lives of their children and husbands. Along with her husband, Adams believed that slavery was not only evil, but a threat to the American democratic experiment. A letter written by her on March 31, 1776 explained that she doubted most of the Virginians had such the "passion for Liberty" they claimed they did, since they "deprive[d] their fellow Creatures" of freedom. An Adams Memorial has been proposed in Washington, D.C., honoring Abigail, her husband, and other members of their family. A cairn — a mound of rough stones — crowns the nearby hill from which she and her son, John Quincy, watched the Battle of Bunker Hill and the burning of Charlestown. At that time she was minding the children of Dr. Joseph Warren, President of the Massachusetts Provincial Congress, who was killed in the battle. Passages from Adams' letters to her husband figured prominently in songs from the Broadway musical 1776. Adams was played by Kathryn Walker in the 1976 PBS mini-series The Adams Chronicles. In the mini-series John Adams, which premiered in March 2008 on HBO, she was played by Laura Linney. 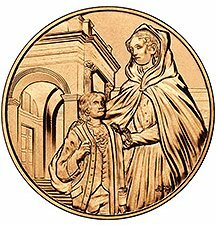 The First Spouse Program under the Presidential $1 Coin Act authorizes the United States Mint to issue 1/2 ounce $10 gold coins and bronze medal duplicates to honor the first spouses of the United States. 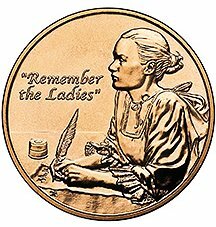 The Abigail Adams coin was released on June 19, 2007, and sold out in just hours. Abigail Adams Facts for Kids. Kiddle Encyclopedia.